Use the flight price comparison tool on the left to compare the airfares of British Airways and South African Airways with 1-stop airlines, and find the cheapest flight from Johannesburg to Victoria Falls. Another option is to fly from Johannesburg to Livingstone (Zambia) and take a transfer across to Victoria Falls (this is fairly easy to do). To ensure you've got the cheapest flight, contrast the price you get on the JNB-VFA route against that on the JNB-LIV route. June 2014. On the 23rd of July 2014 new low cost airline Fly Africa will commence flights on this route. They are advertising very low prices for flights on this route. April 2013. On the 24th February 2013 Munesu Munodawafa, a senior Zimbabwean government official, said that: "We have set in motion plans (for Air Zimbabwe) to re-introduce the Victoria Falls-Johannesburg route from April. This is because most airlines change their flight patterns in April which coincides with the summer season in Europe. So a plan has been set in motion to re-strategise come April. In terms of aircrafts to be used, we are ready on that front." November 2012. Fresh Air is meant to commence flights from JNB to Victoria Falls, but 1time goes into liquidation. March 2012. BA passengers must check in at domestic departures for JNB-VFA flights. December 2011. South African Airways introduces business class seats on its JNB - Victoria Falls flights. There are seperate queues for those who have visas or don't need them, and those who are getting visas on arrival. As it can take a while (like over an hour) to clear immigration, we recommend applying for a visa in advance. Baggage is collected from the aircraft and placed on the ground behind the immigration officers, for you to pick up once you have cleared immigration. As the eagle flies, it's 925km from Johannesburg to Victoria Falls. By road it is 1183km from Johannesburg to Victoria Falls, along the N11 (takes some 16 hours). You'll pass by Bela-Bela, Mokopane and Francistown (Botswana). 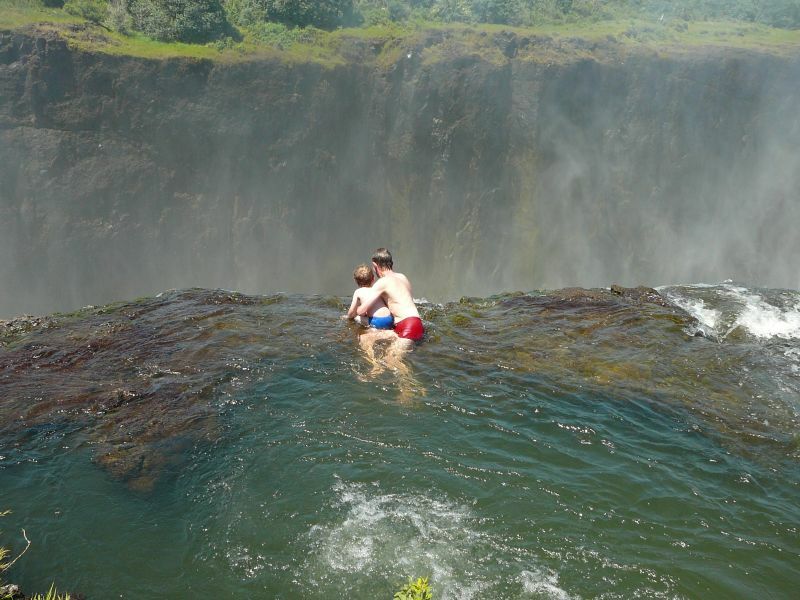 When at the Victoria Falls, go have a look at Devil's Pool, a natural rock pool at the top of the Victoria Falls in Zambia. Here's a list of Victoria Falls hotels. The Kingdom is often a favourite and is well positioned near the Falls. If you're travelling on a shoestring budget, try the Shoestrings Lodge :) On the other side of the price spectrum is the famous Elephant Hills Hotel.